Desire Vilmart. (The "& Cie" mean "and Company" and we'll drop that in our discussion). They have 11 hectares of vines they manage organically with 60% Chardonnay, 37% Pinot Noir, and 3% Pinot Meunier, and produce 8,750 cases of wine yearly. Most of their vineyards are in Rilly (technically Rilly-la-Montagne) but they have a few plots right over the border in the neighboring Villers-Allerand. Vilmart may have been around a long time, but they started to take off when Desire Vilmart's grandson Renan took over in 1930 and established Vilmart as a great wine though his dedication, attention to detail, and fantastic blending abilities. Renan's daughter Nicole married a vineyard worker (what is it about the French screwing the hired help?) named Rene Champs, and they took some (seemingly at the time in traditional Champagne, France) radical steps. Nicole and Renee completely changed some things in unorthodox ways, such as fermenting and aging in oak barrels, instead of the commonly used cement vats. Their son, Laurent Champs, taking over in 1991, continued with massive improvements bringing them to the pinnacle of Champagnes. Champagne Vilmart uses organic techniques in the vineyard, has truly low yields, 2 tons or less per acre, and takes no shortcuts in producing awesome bubbling juice. The grapes are hand gathered by a team of 30 people and pressing is done by a team of four. Any grapes deemed not worthy are sold off, sometimes up to 40%. That is an enormous amount for a small house. All the wine are fermented and aged in oak barrels. For non-vintage wines, in barrels ranging in size from 2,200 to 5,500 liters, called foudres, and smaller 600 liter or 225 liter barrels for vintage wines. Some may claim that Vilmart Champagnes are oaky, however realize that the wines are released quite young and none of them go through malolactic fermentation so that they are slow to develop. It still find them lovely young and fresh out of the bottle, and am aging them as well. They are imported into the US by Michael Skurnik Wines. Grande Réserve - not available in the United States, is their most basic and has 70% Pinot Noir. 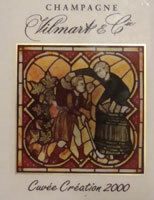 No other Vilmart wine except their Roses have a majority of Pinot Noir. Brut NV 1er Cru Grand Cellier - their basic NV imported into the US, 70% Chardonnay and 30% Pinot Noir. Some have called it the best NV on the market, but that may be exaggeration and of course we all have our own tastes. It's typically a blend of three vintages. Brut Rose NV Cuvee Rubis - this is almost the reverse of the Grand Cellier, with 90% Pinot Noir (10 to 15% still Pinot Noir) and a mere 10% splash of Chardonnay. The nose is often compared to Burgundy - "Sensual layers of perfumed fruit" is what wine critic Robert Parker says. Grand Cellier d'Or - Their entry level vintage wine, 80% Pinot and 20% Chardonnay, and a wonderful one. Grand Cellier Rubis - Their vintage Rose, created using the more expensive and difficult saignée or skin contact method, where the rose color comes from skin contact of the grapes instead of the addition of still Pinot Noir. It is 40% Chardonnay and made in small quantities only during excellent years for Pinot Noir. Cuvee Creation - Their US importer Michael Skurnik reports "basic brashness, the allspice and nutmeg typical for this cuvée" and see our tasting note below. I love this wine, at least the 2000 I tied, not even a great vintage. 70% Chardonnay and 30% Pinot Noir. 2000 is the last vintage ever, and the fruit from now on goes to the NV and vintage Grand Cellier. Coeur de Cuvee - The pinnacle of their wine, made from their oldest vines, all older than me! 50 years+ vine age. It is 100% aged in oak barrels, and 80% Chardonnay and 20% Pinot Noir. It is made only from the "heart" or middle portion of the barrel, as the first and last parts are "bled" off, and made from the oldest vines, all over 50 years old. Made from the "heart" or "Coeur" of the juice, the most concentrated, with the beginning and last part of the pressing not included. Ratafia: They also make a 100% Pinot Noir and traditional Champanoise liqueur called Ratafia. 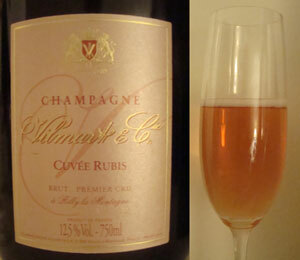 See also Vilmart Grand Cellier, Couer de Cuvee & Cuvee Creation Tasting - Jan 2012 - Wow! A rich pink and orange color. The nose is bread dough immediately, followed by rich minerals and rolling minerals together with a little lime. A spicy chalky component. Full of minerals, orange, pomegranate, and red apples. Lemons and limes as it warms. Layers and layers of flavors. Red fruits as it warms and breathes: cherries, plums. Massive and powerful, yet sweet, friendly, and inviting! This can stand up to a steak, or be enjoyed on its own! How can their vintage Rose Grand Cellier Rubis be much better? I'll have to find out! Interestingly in a clear bottle, like Cristal. 70% Chardonnay and 30% Pinot Noir. On the nose. orange citrus, tangerines, oranges with a certain nectar like scent that is fascinating. Minerals and chalk as it warms and breathes. On the palate there is a lightness and elegance originally, with a richer and supple backend. Some lime, a touch of honey. Powerful yet elegant. Apple as it warms. This just got better and better as it aired. This will be an absolute stunner in a few years, and is quite awesome today. I'll agree with noted wine critic Robert Parker's rating of 94 points out of 100.